Two materials, lonsdaleite and wurtzite, have just been recognized as being harder than diamonds. Lonsdalite, similar to diamonds that its made from carbon, is formed during asteroid impacts, and is 58% harder than its cousin. Wurtzite boron nitride is formed during heavy volcanic eruptions and can be up to 18% harder than diamonds. cousin of the diamond, a hexagonal arrangement of carbon atoms that's 58% stronger than its shimmering relative, according to a computer simulation of its behavior. It's forged in nature during asteroid impacts. The other mineral, wurtzite boron nitride is even more enigmatic. 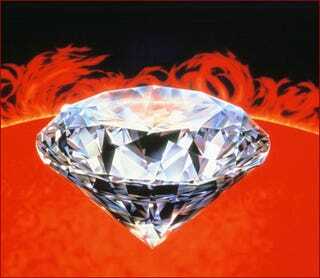 It comes together in especially punishing volcanic eruptions, and has flexible atomic bonds. When placed under stress it hardens until it is 18% stronger than a diamond.